Spinning is a fascinating process that has been around for thousands of years, but understanding the fundamentals can help make you a better spinner. Yarn can be classified by how many strands are twisted together. If you twist fiber so it forms a string you have single-ply yarn, or a single. Multi-ply yarn is twisting 2 or more of those singles together. For this article we will just be simply referring to “multi-ply yarn” as “yarn” since that is what most spinners do. This is 2 ply Z-twist yarn. A spinning wheel takes the animal or plant fibers and twists them together into a single. In a separate step, the spinning wheel also plies two or more of those singles together into yarn by plying them in the opposite direction of the single. So, if your spinning wheel is going clockwise while spinning the singles you should run it counter clockwise during plying. If you don’t ply in the opposite direction of the singles, you’ll see that the plying over twists the singles and the singles don’t nicely wrap around each other. Try plying in the wrong direction one time and you’ll quickly see how the yarn just won’t look or feel right. When plying yarn, you’ll either get Z-twist or S-twist yarn depending on the direction your flyer is spinning. In the image to the right you can see how Z-twist goes up and to the right, but S-twist goes up and to the left. Your twist depends on the type of the spinning wheel you have, so generally the easiest way to figure this out is to spin some fiber and look at it. The difference between S-twist and Z-twist yarn. Now that we have covered the basics of the different types of twisting that make yarn, let’s discuss how the spinning wheel puts the twist into yarn by focusing on singles. At the most basic level, a spinning wheel consists of the flyer and the bobbin. There are three main types of spinning wheels that drive the bobbin and flyer in different ways. Scotch Tension has the drive belt on the flyer, and a tension band on the bobbin makes the bobbin spin slower than the flyer which adds twist. Irish Tension has the drive belt on the bobbin, and a tension band on the flyer makes the flyer spin slower than the bobbin which adds twist. Lastly the Double Drive has a drive belt on both the flyer and the bobbin, and different gear ratios cause the flyer and belt to spin at different speeds. Sometimes the tension band is called a brake band. This is because it acts like a brake and slows either the flyer or bobbin down. 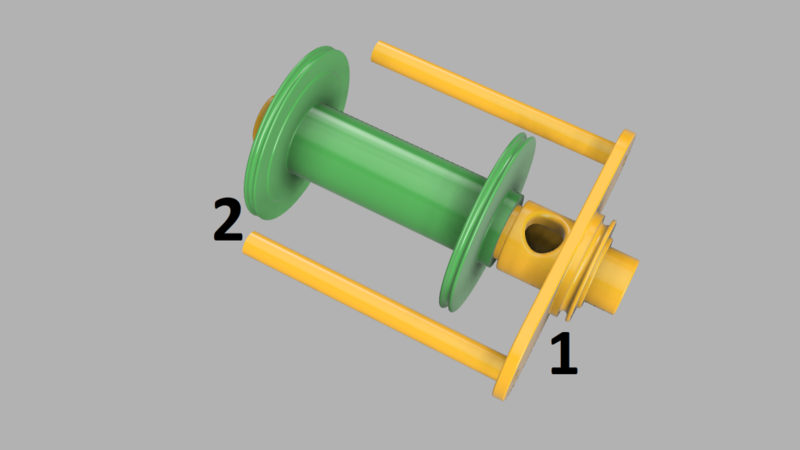 This shows a flyer in yellow and a bobbin in green. #1 is where the drive belt or brake band is attached to the flyer and #2 is where the drive belt or tension band is attached to the bobbin. With all these different types of spinning wheels the important part to remember is the flyer and bobbin are spinning at different rates. Making singles depends on one spinning faster than the other. The spinning wheel is both twisting the fiber and wrapping it around the bobbin. To see how that’s happening let’s think about what happens in some extreme cases on a Scotch Tension spinning wheel. With Scotch Tension what happens if the flyer is turning and the bobbin is not because you have a high tension setting? If the bobbin is not turning, the fiber goes onto the bobbin with no twist. So, the single would fall apart because there would be no twists to hold it together. In the other extreme, what happens if the flyer and bobbin are turning at the same speed? Twist is being applied to the fiber, but no fiber is pulled onto the bobbin. The fiber will keep twisting until it breaks. This is obviously too much twist in the yarn. For Irish Tension it’s a little different. So in one extreme when the flyer is stopped and the bobbin is spinning there is no twist. In the other extreme where both flyer and bobbin are spinning at the same speed there is too much twist (this case is the same as Scotch Tension). So, what makes good yarn is the difference in the speed of rotation of the flyer and the bobbin. A smaller difference in rotational speeds between the flyer and bobbin will result in yarn being pulled onto the bobbin more slowly and thus a higher twist per inch. Remember, the smaller the difference in rotational speed between the flyer and bobbin the more twist there will be. When spinning you must consider one more factor, which is uptake. Uptake is the amount of pull on the fiber. If you feel a lot of uptake, then there is too much tension on the bobbin. On the other hand, if there is no uptake, then the rotation of the bobbin is zero and your single will get too much twist. If you let the uptake pull the fiber into the wheel too quickly then your single will not have much twist. The point here is while the tension band is what creates uptake, the final decision on how much yarn actually goes on the bobbin is your fingers, which is holding the fiber. So, even if there is a lot of uptake if your fingers aren’t letting fiber onto the bobbin then the bobbin will spin at the same rate as the flyer, and you will have over twisted yarn. With practice a spinner gets the feel for all this and will let the spinning wheel pull in fibers at a ratio that will give their singles the amount of twist the spinner wants. There you have it. If you have any questions let me know either in the comments or with our contact-us page.